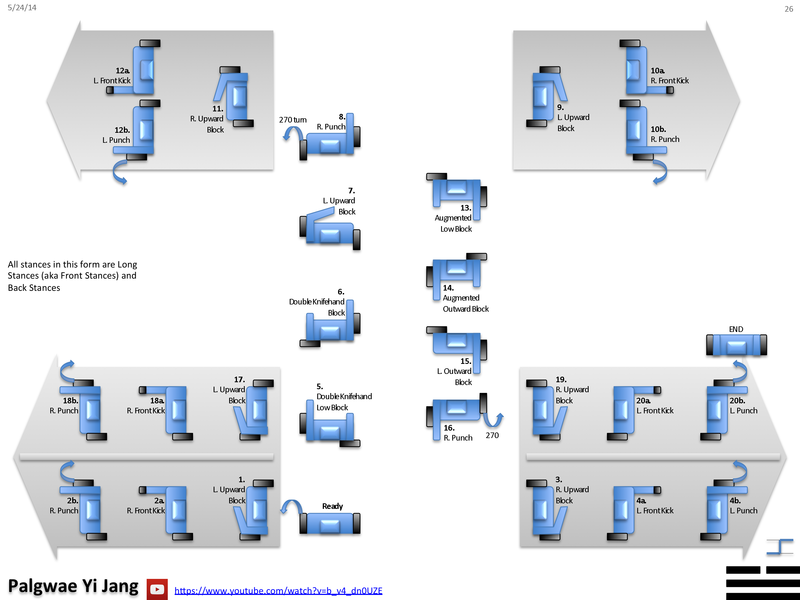 There are known errors in some of the diagrams below. 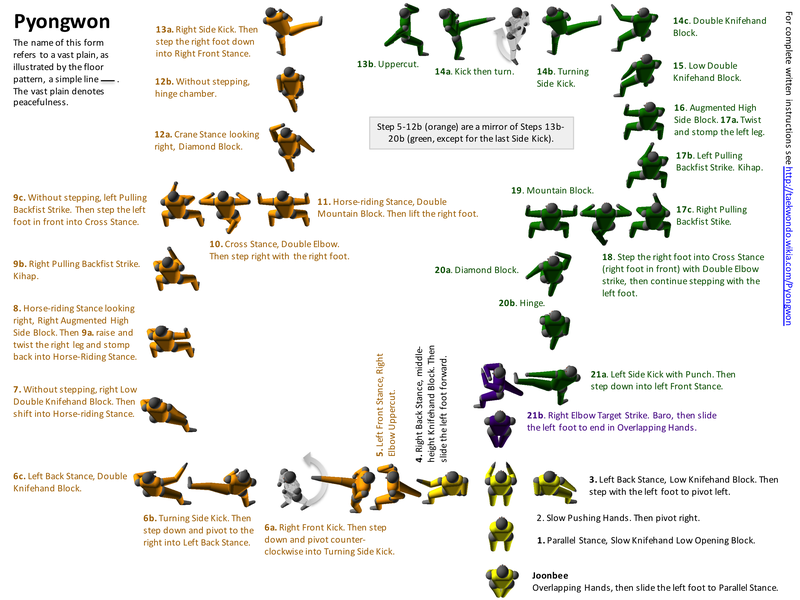 Please see taekwondo.wikia.com for the correct versions of these diagrams. I’ve been putting all my effort there these days, on the wiki, rather than updating this blog. Looking for my PowerPoint files? They’re here: http://dropcanvas.com/7viem. 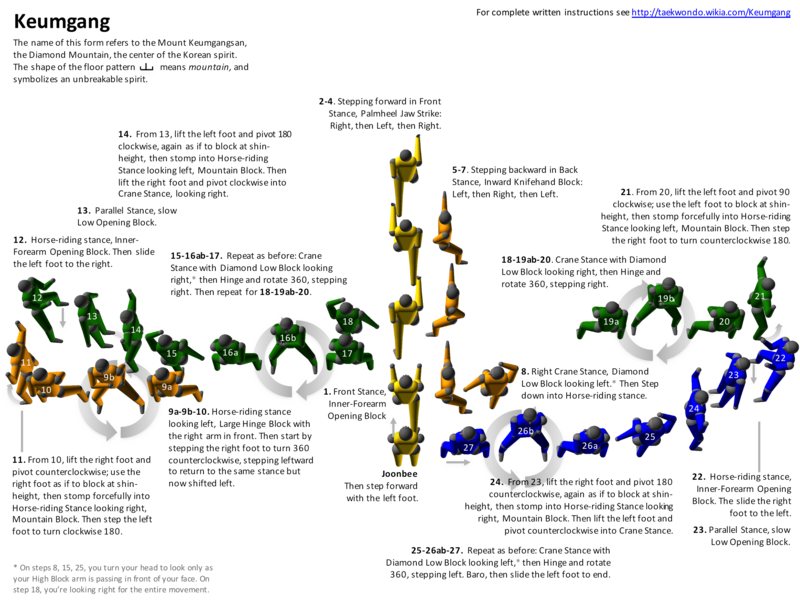 The PowerPoint files have editable versions of all the diagrams. Introduction – Why This Study Guide? Of course one cannot learn taekwondo poomsae (pumse, poomse, patterns, or “forms”) simply by looking at diagrams. For many taekwondo students, however, remembering the basic steps of a form is an important (but difficult) first step. 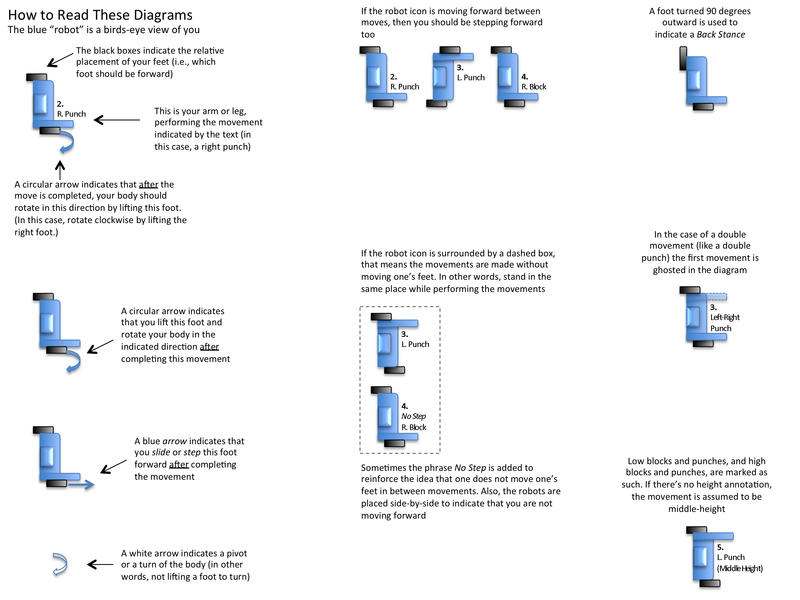 As you are learning a new form, the diagrams shown below may help – simple study guides that you can print-out and carry with you (or view on your computer of smartphone) to help you memorize the basic steps of each form. My diagrams start at the bottom of the page rather than at the top. I think this makes them easier to read. The first diagrams, the kibon poomsae, are the basic forms used at Majest Martial Arts* for the very early belts (white, yellow, orange). 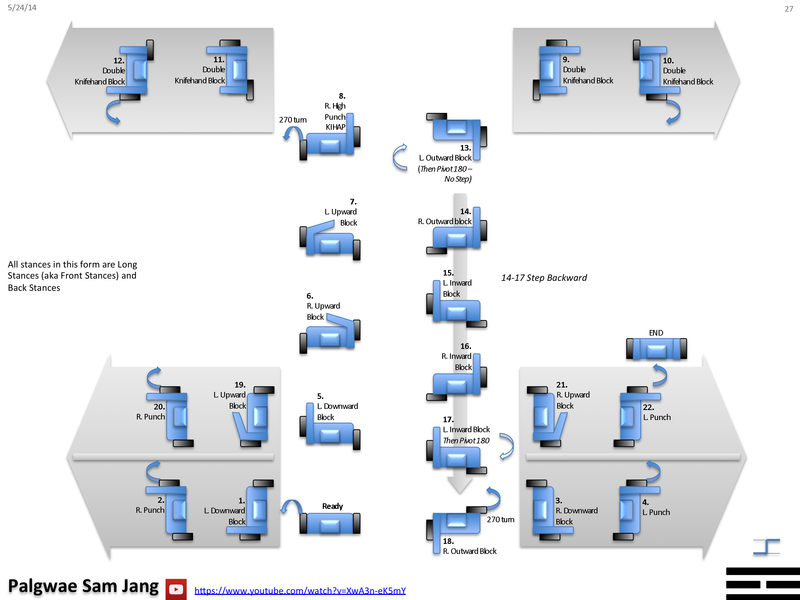 Below those simple kibon diagrams you will see the taegeuk poomsae diagrams, the standard World Taekwondo Federation (WTF) forms used at most taekwondo schools in the U.S.
Below that, the standard WTF Black Belt forms. 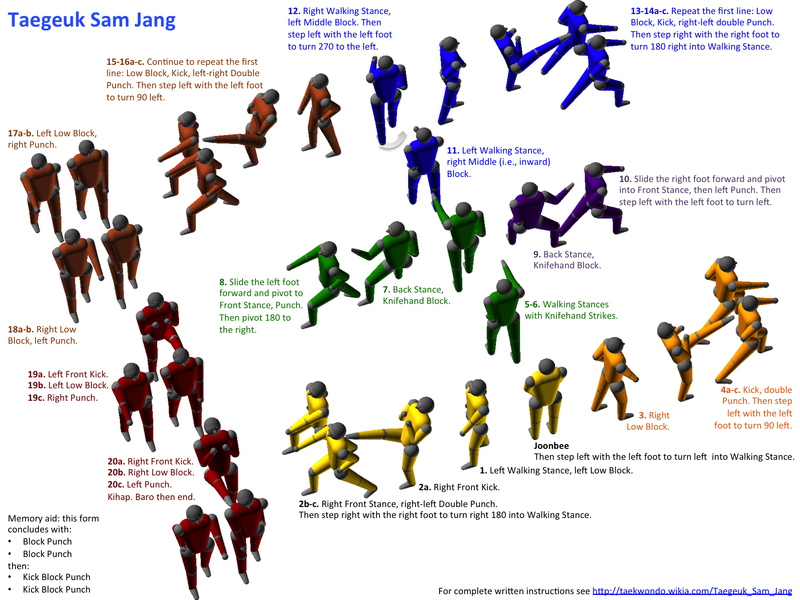 And finally, palgwae poomsae diagrams. 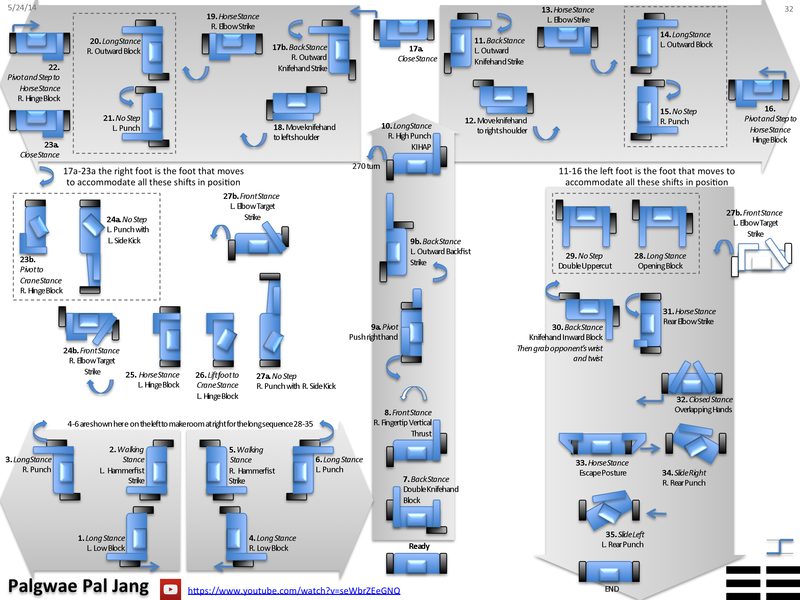 Why palgwae diagrams? Because at Majest, Black Belts also study palgwae forms. 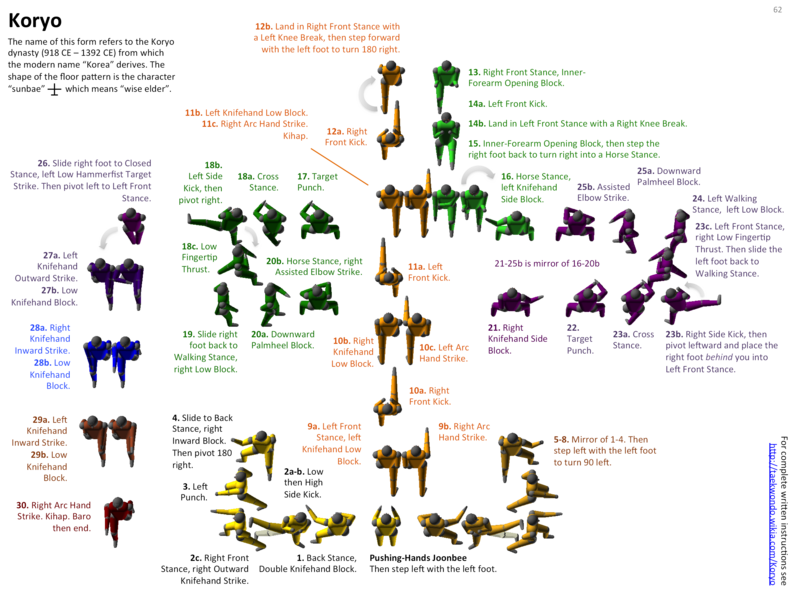 In the taegeuk diagrams below, the color of belt (green, purple, blue, etc.) 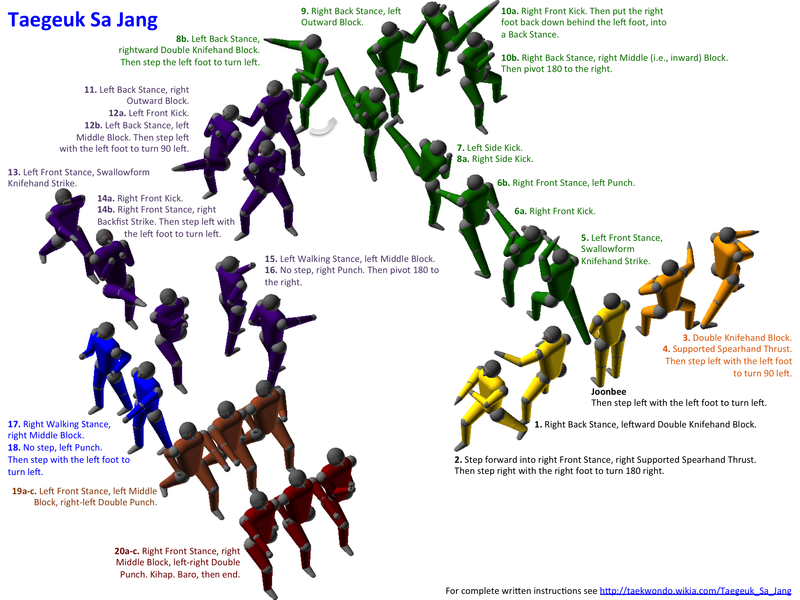 associated with each form at Majest is also identified in the diagram, but of course different taekwondo schools use different color schemes. 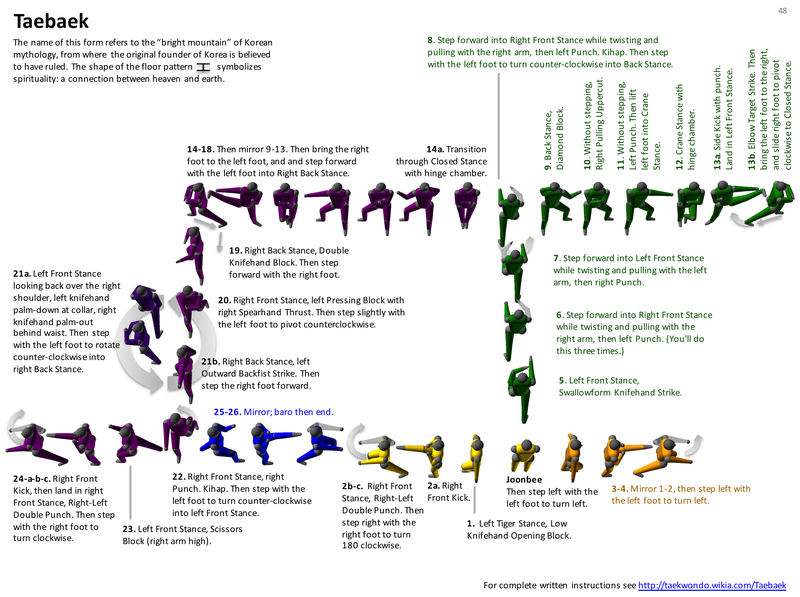 The poomsae themselves will be the same from one WTF school to the next, so if you are a taekwondo student at a different school, these diagrams should still be helpful. 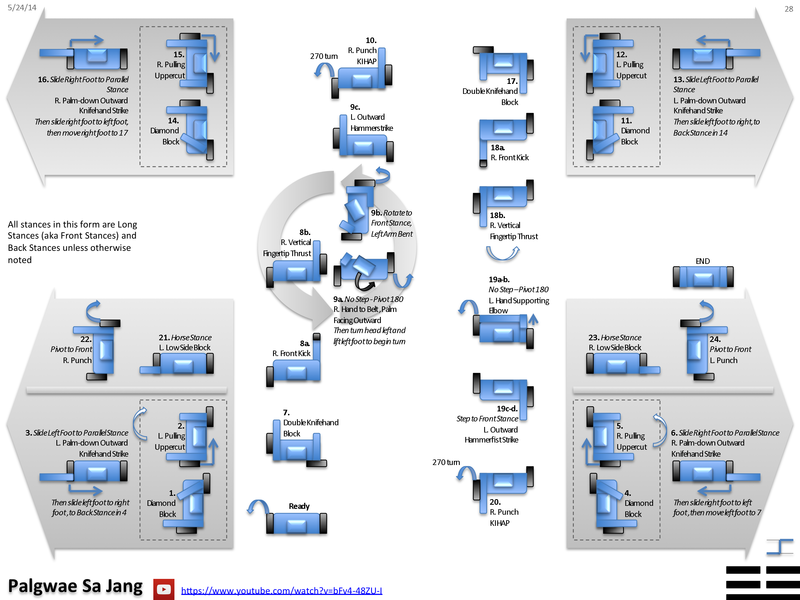 Clicking on any diagram below will give you a nice large version that you can print and see clearly. You can also download PowerPoint and PDF versions of these diagrams at http://dropcanvas.com/7viem If you have suggestions for improvements or other comments, let me know! At Majest, white belts study Kibon Hana to progress to yellow belt. 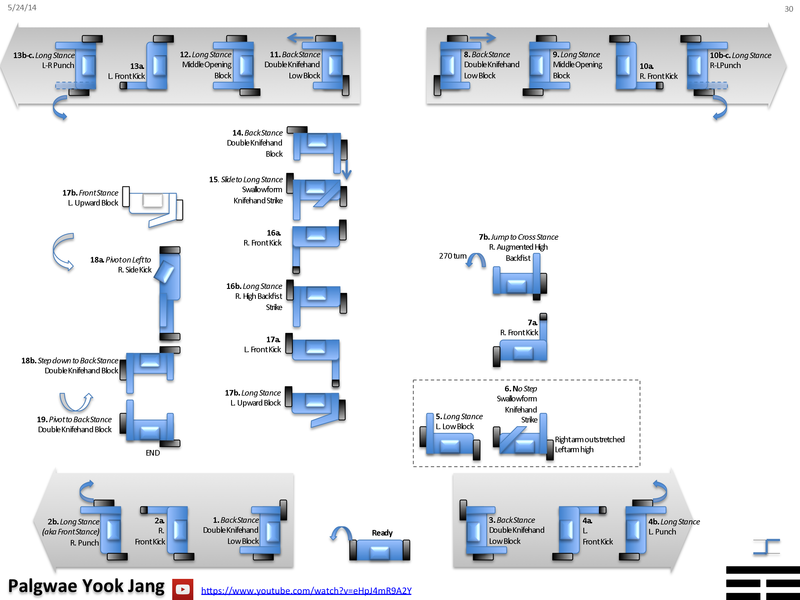 The idea of the diagram below is that the little blue robot is an overhead view of you, beginning at the bottom of the diagram. 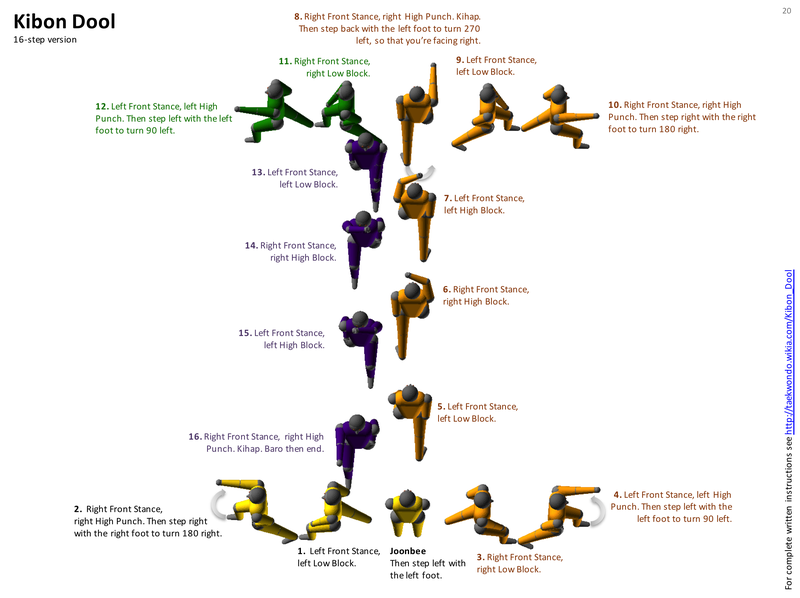 Of course the diagram doesn’t show every subtle nuance of the form (such as how to chamber your arms between movements), but if all you’re trying to do is remember the basic pattern of the form, this diagram should be helpful. Since different schools may use very different kibon forms (and some schools refer to the kibon poomsae using the similar phrase kicho hyung), it can be a little difficult to find good videos showing these forms being executed. For this version of Kibon Hana, I like this video from BlackBeltStudios because (halfway through the video) it shows you the form “from the back” which is how you see it in class when the instructor performs it with you. In Kibon Hana, when you prepare for the downward block (also called a Low Block), you “chamber” your fist first by placing it at your opposite shoulder. What should the off hand be doing during this time? You should be “aiming” it by pointing the off-fist forward, out in front of you. For almost all the poomsae you will learn, learning the proper chamber and aim that precedes each step will make your poomsae so-o-o-o much better, and often they make the form easier to memorize as well. Try to get some good “snap” in your downward blocks. Let’s supposed your doing a downward block with your left arm; chamber your left fist to the right shoulder, with the thumb-portion of the fist pointing out in front of you. As you bring the arm down, keep the back of your fist pointing downward until near the end of the motion, so that at the last moment the wrist can twist and “snap” into position for the block. Same goes for the punches: try to get a good “snap” by rotating the fist toward the end of the punch (not at the beginning of the punch). Remember these are Long Stances (aka Front Stances); if you can see your toes below your forward foot, you haven’t bent your forward knee enough (your knee should be blocking your view of your toes). Likewise, the rear knee should be straight, not bent, with the heel of the foot firmly on the floor. Yellow belts study this form at Majest, to progress to orange belt. The pattern of footwork is the same as Kibon Hana; only the hand movements differ. At other schools, a form like this might be studied by white belts with a single stripe on their belts; different schools use different belt colors. In fact, not all schools will even have two or three kibon forms; they might have just one kibon form. For that reason, finding videos of these forms is very difficult. White belt students at schools other than Majest might go straight into taegeuk forms. The taegeuk poomsae shown later in this blog are fairly standard though, so they should be useful for students at any WTF-based school. 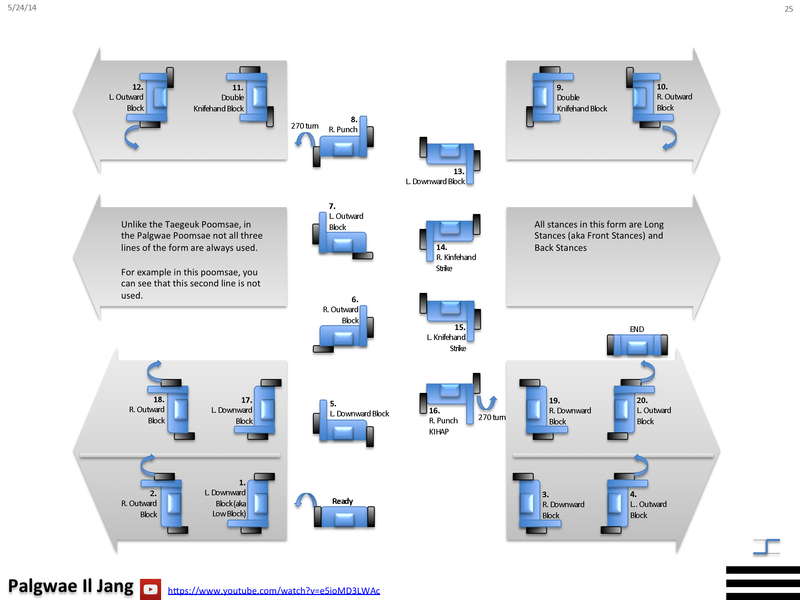 These kibon diagrams however are probably most useful only to students at Majest Martial arts. 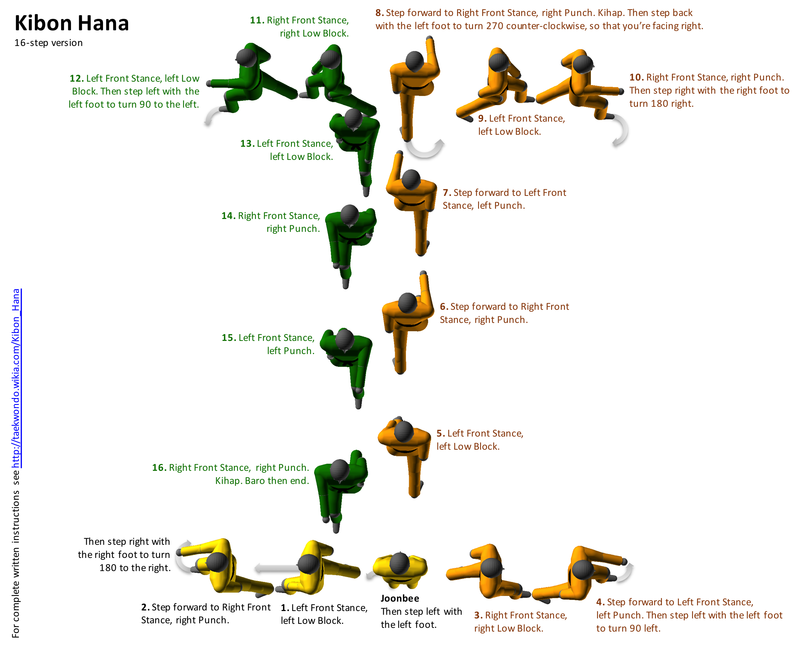 You’ll notice the pattern of footwork for Kibon Dool is the same as Kibon Hana. That makes it easy to remember! The punches should be high punches, meaning you should imagine punching at the height of your nose. 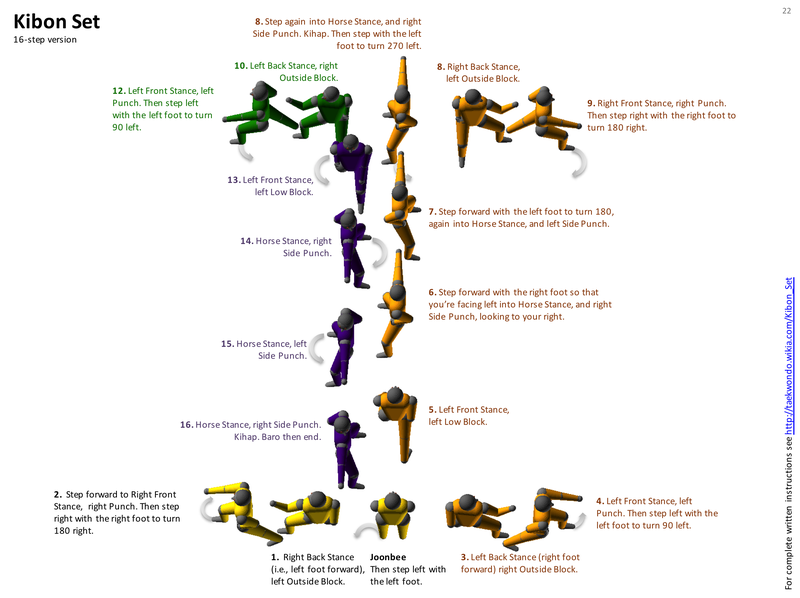 Orange belts study this form at Majest, to progress to green belt. Note that this form follows the same “zig zag” lines as the first two forms: first left and back; the up the middle, then right and back, then back down to the starting point. This time, however, the stances are different. This form is also fun because of the outward blocks at steps 1, 3, 9, and 11. To chamber for a Left outward block, put the left fist down by the right side of the waist (again, thumb facing away from your body; in other words, palm-up), and put the right fist up by the left shoulder (again, palm-up). Remember that for the outward blocks, the fist should be pointed downward by the end of the block. Also, when you’re moving from one side punch to the next, don’t rotate from side-to-side with your legs spread out like a cowboy who’s been riding his horse too long! Move one foot in towards the other, rotate, then move the feet apart again. Also, try to keep your head the same height throughout all the moves. You don’t want to bob up-and-down as you move. When you’re punching — especially for the side punches — remember to always be looking in the direction of the punch. Personally, I like the way the above form begins with an outward block; that’s good practice for some of the taegeuk forms show below. Fun fact: World Taekwondo Federation (WTF) poomsae always begin with a block, never a strike. This symbolizes the fact that taekwondo is intended for self-defense. Finally! We’re at the standard taegeuk poomsae. At Majest, green belts study the first taegeuk form (Taegeuk Il Jang) to advance to purple belt, but of course different taekwondo schools use different belt colors. 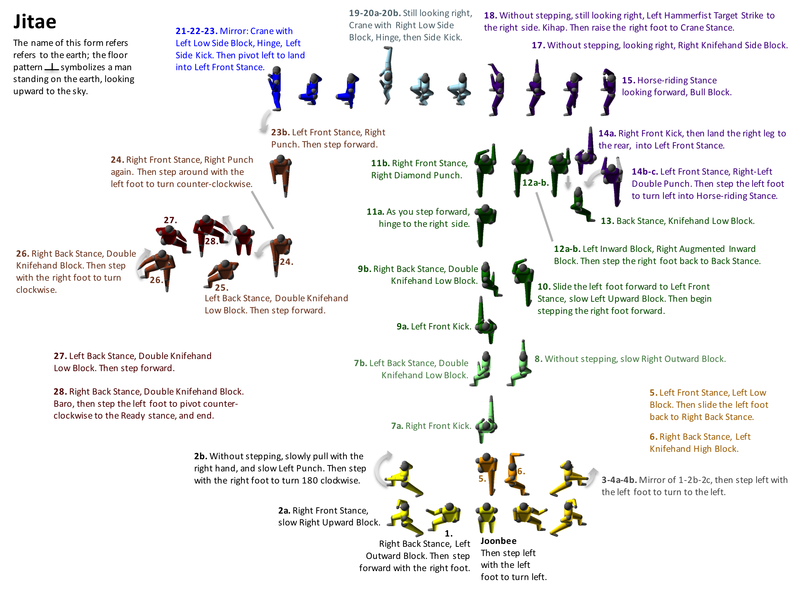 Still, the form itself should be the same at any WTF-based taekwondo school, so hopefully any taekwondo students reading this blog will find the following diagrams useful. 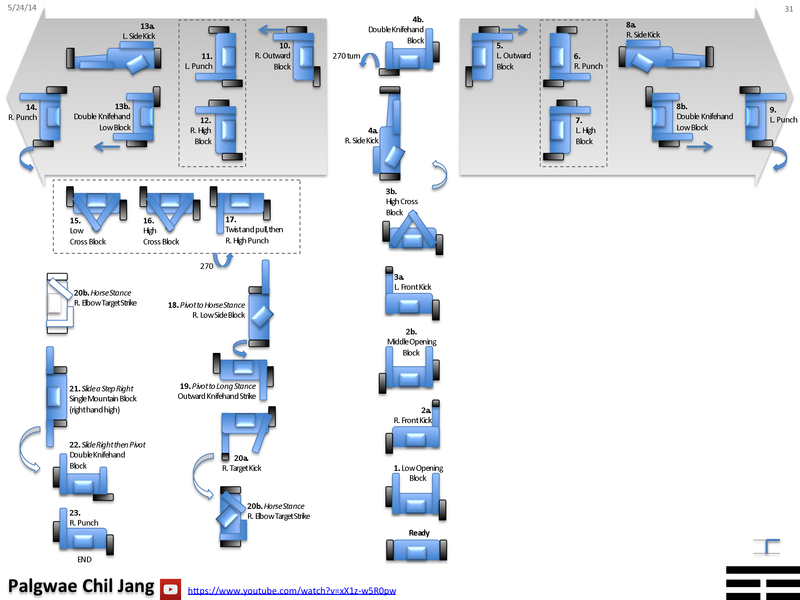 In addition to these static diagrams, it is often helpful to watch videos of these forms being executed. 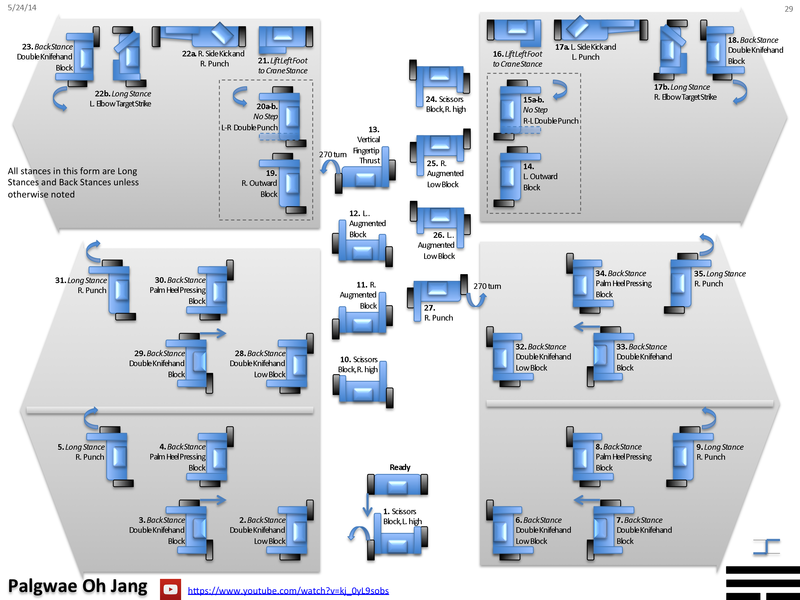 Videos can help you learn the subtleties of a form, while these diagrams are helpful only for memorizing the basic steps — in other words, keep in mind that these diagrams can’t provide all the detail you need to know to perform the poomsae perfectly. This is just a study aid. You can find excruciatingly detailed instructions for performing Taegeuk Il Jang at the Taekwondo Wikia. 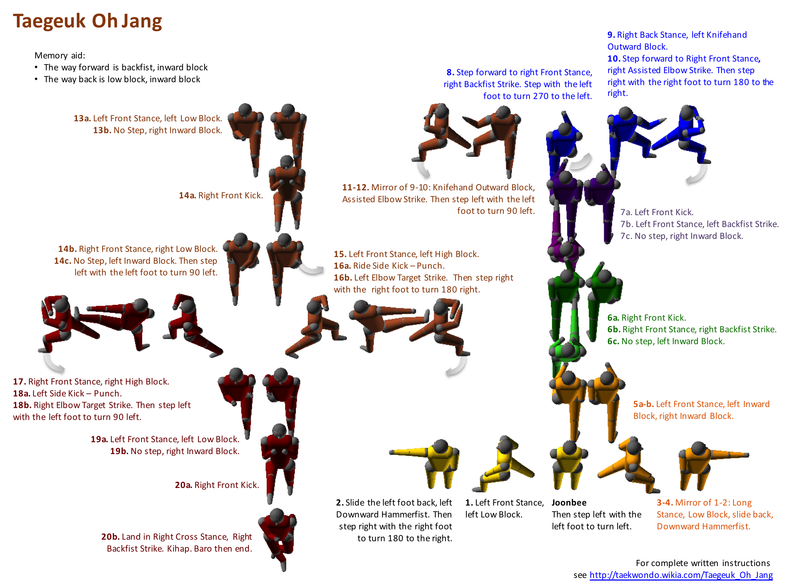 The stances in this poomsae are pretty easy: mostly just walking stances. The transition from step 6 to step 7 might feel a little weird until you get the hang of it. You pull the right foot forward only about half a step (not a full step forward), then pivot to the right. The transition from step 10 to step 11 might feel weird too: At the end of step 10, instead of chambering the punching hand to get ready for the next move, you chamber the belt hand instead. That can take some getting used to; it might feel a little weird at first. Likewise the transition from step 16b to step 17 might feel a little weird, on two counts: First of all, at the end of step 16b, as you get ready to turn to the right, you’re going to be tempted to move your right foot, but don’t! You move your left foot instead, pivoting to the right on the ball of your right foot. This is different from most of the turns you’ve done before. Also, at the end of step 16b, it might feel like you should be chambering the right hand, but don’t! Chamber the left hand instead, the punching hand. This entire transition from 16b to 17 is just “different” from the kinds of turns you see in most of the poomsae; it’s an oddball turn. Also, when you perform the front kicks, where should you put your hands? A good tip for beginners is to aim the non-punching hand at the outset of the kick, so that when you complete the kick you’re all set for the subsequent punch. It feels pretty natural, but you might think it looks kind of weird to be holding one arm out in front of you while you kick! And you’re right, it is a little weird. But it’s a good way to practice for beginners. Once you’re used to doing the kick-and-punch though, it’s probably more common to hold both fists up in front of your chest as you kick, as if you’re trying to block somebody from punching you while you’re kicking. Then as you complete the kick you do a quick, slight aim with the off hand and then punch. This is the second taegeuk poomsae. You’ll notice that all of the taegeuk poomsae are organized as three horizontal “lines.” You start at the bottom line going left then right. Then there’s a transitional movement that takes you to the second line, then to the third line, and then back down again. 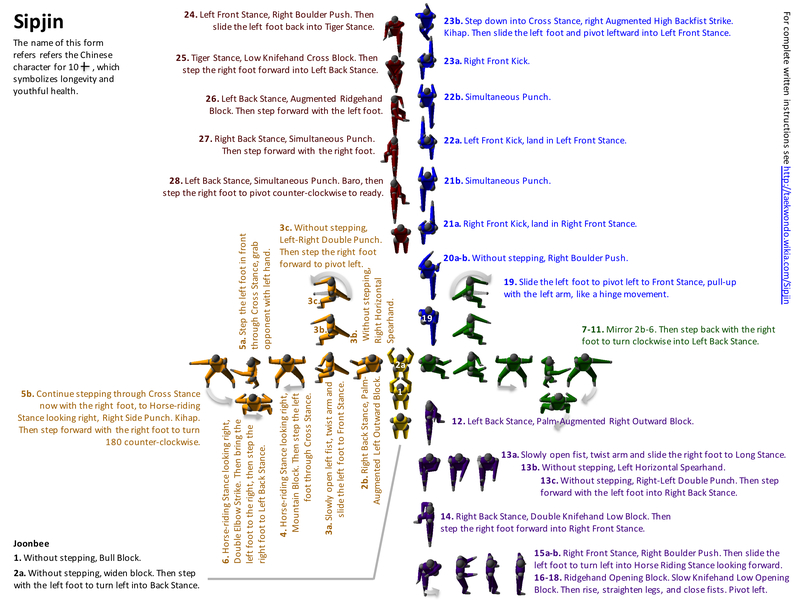 You’ll see that basic pattern repeated over and over again in all of the taegeuk poomsae. Sometimes this form is spelled as Taegeuk Ei Jang or Taegeuk Ee Jang. You can find excruciatingly detailed instructions for performing Taegeuk Yi Jang at the Taekwondo Wikia. You’re going to have the same problem with this form that you had with the last form: what to do with your hands during the kick? Again, when you’re first learning the form, it doesn’t hurt to aim with the off hand during the outset of the kick, so that at the conclusion of the kick you’re all ready for your punch. As you transition from step 7 through step 8b, it might feel a little weird to use a front kick to move from a walking stance into a long stance (aka a Front stance). It almost feels like you’re kicking your right foot out in front of you, then letting it drop at the end into the long stance. It just doesn’t feel very graceful; it almost feels like you’re “falling” into the long stance. But that is indeed how it’s done. Here’s a good video on YouTube of Taegeuk Sam Jang by Grand Master Kyu Hyung Lee. Here’s one from BlackBeltStudios. You can find excruciatingly detailed instructions for performing Taegeuk Sam Jang at the Taekwondo Wikia. You’re going to have the same problem with this form as you did with the last one: you transition from walking stances into long stances by means of a front kick. It’s going to feel like you’re “falling” into your long stances. That’s just how it’s done. The double punches (like at step 2b-c) should be fast, like a single count. There’s no beat or pause between the two punches. Where do most people seem to have trouble with this form? It’s at the final run: steps 17a onward. The constant back and forth — left and right — block, punch, kick, block, punch…it’s so easy to lose track of whether you should be using your right hand or your left hand. But there’s actually a simple trick to make this easier to remember: chamber and aim for the upcoming downward block as you start each kick. I know it looks awkward, but it makes it easy to remember: you simply chamber left, then chamber right, then chamber left, then chamber right…alternating. Once you have it well memorized, you can stop using the “awkward” technique to remember the sequence and you can make it more graceful by (as is normal) bringing both fists in front of you during the kicks. But until you reach that level of memorization, the “always chamber at each step” rules makes this form much simpler to memorize. Here’s a good video on YouTube of Taegeuk Sa Jang by Grand Master Kyu Hyung Lee. Here’s one from BlackBeltStudios. You can find excruciatingly detailed instructions for performing Taegeuk Sa Jang at the Taekwondo Wikia. I think this form feels pretty natural, up until you get to the transitions between steps 14 through step 19. It feels weird to being doing inward blocks that are opposite the direction your body is pivoting. It takes some getting used to. Sometimes this is spelled Taegeuk O Jang. Here’s a good video on YouTube of Taegeuk Oh Jang by Grand Master Kyu Hyung Lee. Here’s one from BlackBeltStudios. You can find excruciatingly detailed instructions for performing Taegeuk Oh Jang at the Taekwondo Wikia. Remember: up the middle it’s backfists and inward blocks. Coming back down it’s downward blocks and inward blocks. At 16a, leave your right arm outstretched in preparation for the upcoming target strike. Same goes for 18a. The final “hop” at 20b is intended to have you hop onto the front of your opponent’s foot so that he or she can’t back away from you. Sometimes this is spelled Taegeuk Yuk Jang. Here’s a good video on YouTube of Taegeuk Yook Jang by Grand Master Kyu Hyung Lee. You can find excruciatingly detailed instructions for performing Taegeuk Yook Jang at the Taekwondo Wikia. This is another one of those forms where the first line and the third line are the same. That makes it easier to remember. A lot of people seem to have trouble remembering Step 5 and Step 11. “Which hand is used? Which foot goes forward?” Here’s a couple of tips: (1) the forward hand and the forward hand are always opposite. So for example at Step 5 it’s the right arm forward, therefore it must be the left foot forward. (2) the blocking hand will always be pointing in the direction of the upcoming kick. Here’s a good video on YouTube of Taegeuk Chil Jang by Grand Master Kyu Hyung Lee. Here’s one from BlackBeltStudios. 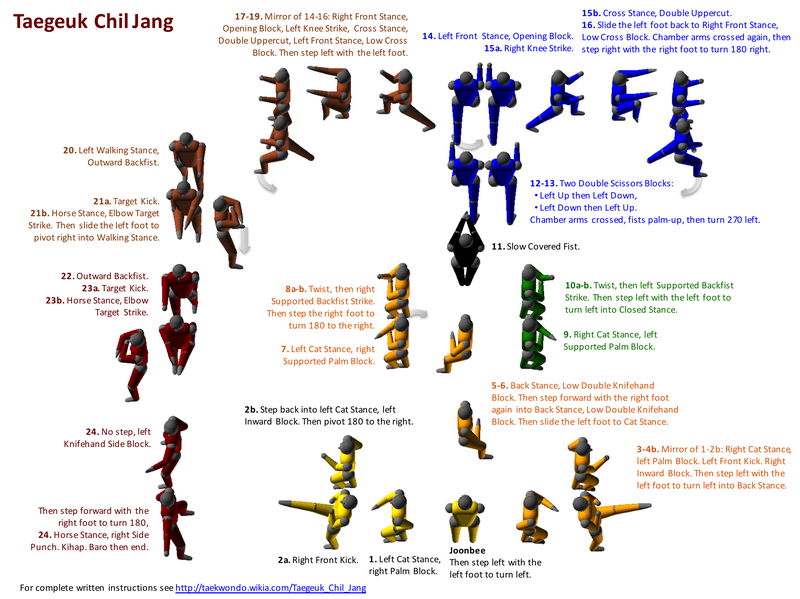 You can find excruciatingly detailed instructions for performing Taegeuk Chil Jang at the Taekwondo Wikia. This is the eighth and last of the “taegeuk” series of poomsae. Sometimes it is spelled Taegeuk Phal Jang. Here’s a good video of Taegeuk Pal Jang on YouTube by Grand Master Kyu Hyung Lee. Here’s one from BlackBeltStudios. You can find excruciatingly detailed instructions for performing Taegeuk Pal Jang at the Taekwondo Wikia. At Majest, Black Belts study Koryo but also study palgwae poomsae as well. See below for additional details. 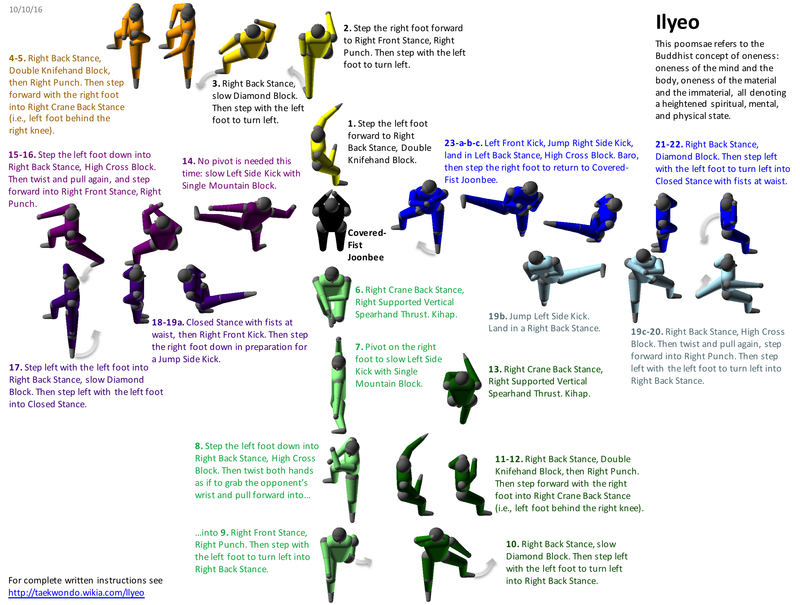 Here’s a good video on YouTube of Koryo by Grand Master Kyu Hyung Lee. Then at the second dan, Koryo is studied along with Keumgang (Guhm-Kang) and all the remaining Palgwae forms. Sometimes Keumgang is spelled Kumgang or Guhm-kang. Here’s a good video on YouTube of Keumgang by Grand Master Kyu Hyung Lee. Here’s a good video on YouTube of Taegaek by Grand Master Kyu Hyung Lee. Here’s a good video on YouTube of Pyongon by Grand Master Kyu Hyung Lee. Here’s a good video on YouTube of Sipjin by Grand Master Kyu Hyung Lee. Here’s a good video on YouTube of Jitae by Grand Master Kyu Hyung Lee. Here’s a good video on YouTube of Cheonkwon by Grand Master Kyu Hyung Lee. Sometimes Hansoo is spelled Hansu. Here’s a good video on YouTube of Hansoo by Grand Master Kyu Hyung Lee. Here’s a good video on YouTube of Ilyeo by Grand Master Kyu Hyung Lee. This is a study guide for taegeuk poomsae, right? So why am I including palgwae poomsae? Because at Majest, Black Belts study palgwae forms in addition to conventional Black Belt forms. Why are there no YouTube videos from Grand Master Kyu Hyung Lee for these palgwae poomsae? Because the World Taekwondo Federation considers these poomsae to be deprecated — they’re older and no longer practiced as widely. There are some good palgwae videos though from Master Jung TKD. Some people consider these poomsae to be “prettier” and more “traditional” than the taegeuk poomsae. Here’s a good video of Palgwae Il Jang from Master Jung TKD. 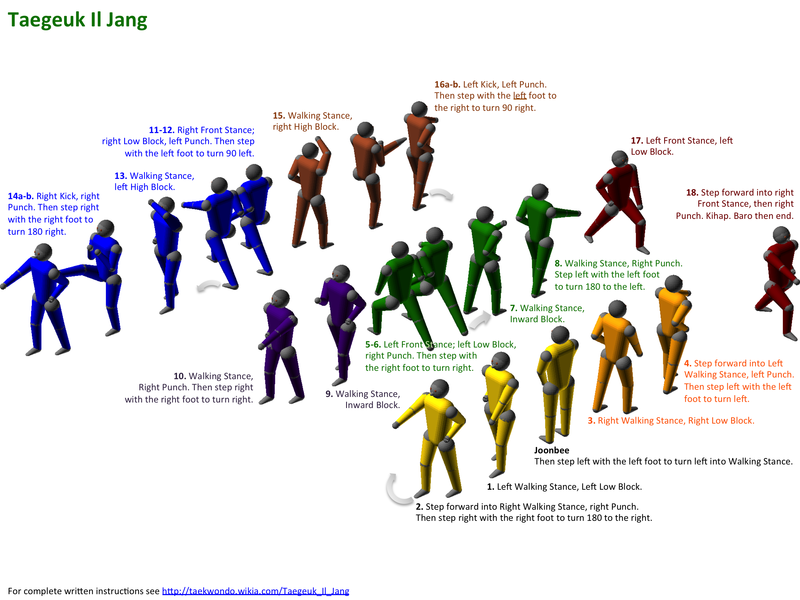 Here’s a good video of Palgwae Yi Jang (also spelled Palgwae Ee Jang) from Master Jung TKD. Here’s a good video of Palgwae Sam Jang (also spelled Palgwae Sahm Jang) from Master Jung TKD. Here’s a good video of Palgwae Sa Jang (also spelled Palgwae Sah Jang) from Master Jung TKD. 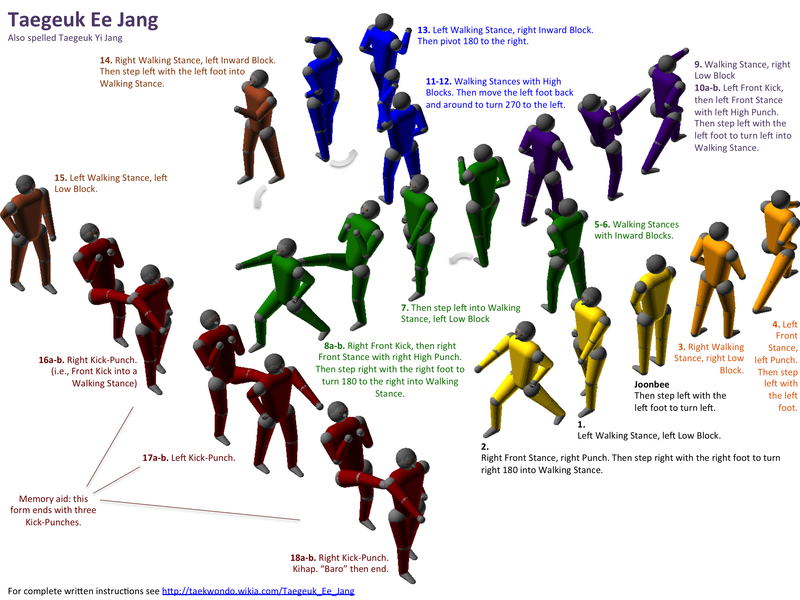 Here’s a good video of Palgwae Oh Jang from Master Jung TKD. 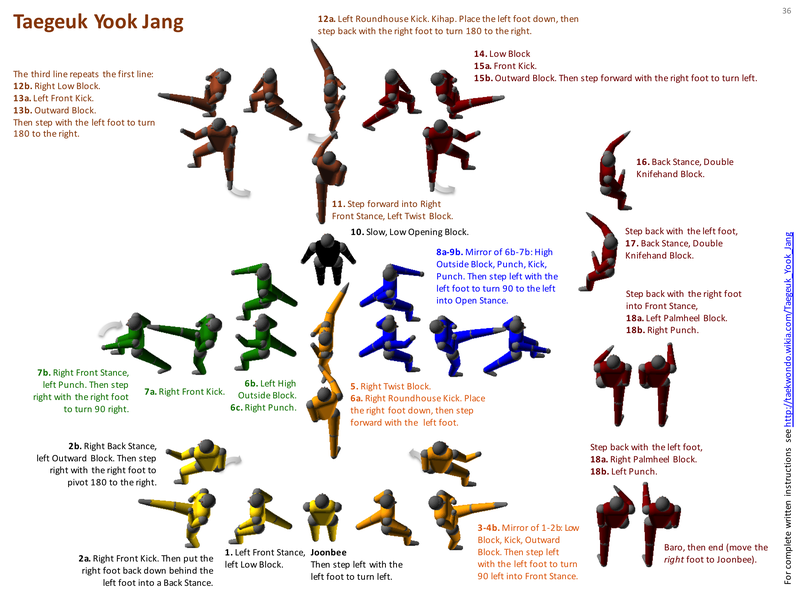 Here’s a good video of Palgwae Yook Jang (also spelled Palgwae Yuk Jang) from Master Jung TKD. 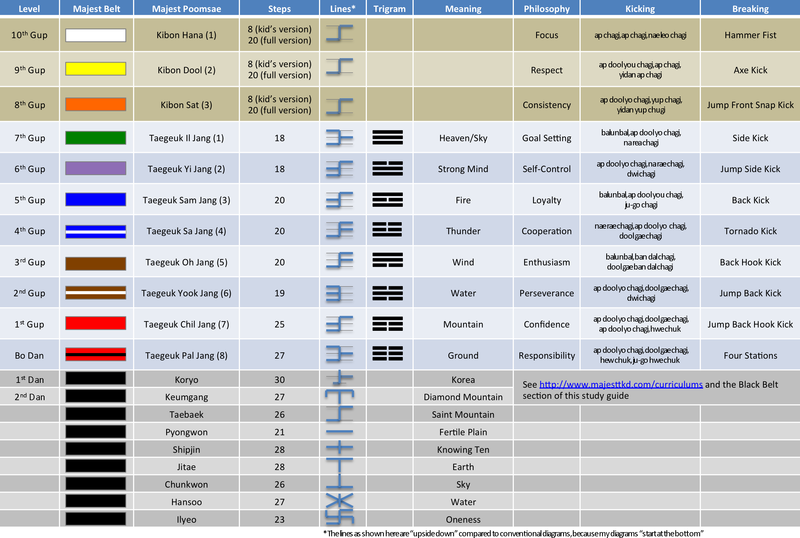 For students at Majest Martial Arts, there are additional useful study aids available at http://dropcanvas.com/7viem There are PowerPoint and PDF versions of the above diagrams, as well as test-question study guides, Korean-language flash cards, and helpful study tips. The curriculum at Majest Martial Arts. The little blue robot is you. Specifically, it’s an overhead view of you. When the robot turns left, you turn left. When the robot turns right, you turn right. Which foot do you lift to turn? You lift the foot that has the arrow on it, and turn your body in the direction of the arrow. The little black boxes are your feet. If the left box is forward of the right foot, then your left foot should be forward of your right foot. Simple! You can’t always tell what the stance is by looking at the robot’s feet, but at least you can figure out which foot is forward. The steps in each poomsae are numbered 1, 2, 3 in what I think is a fairly standard taegeuk numbering scheme. And then with each number there’s a short reminder of what the movement is at that step: right punch, left front kick, etc. 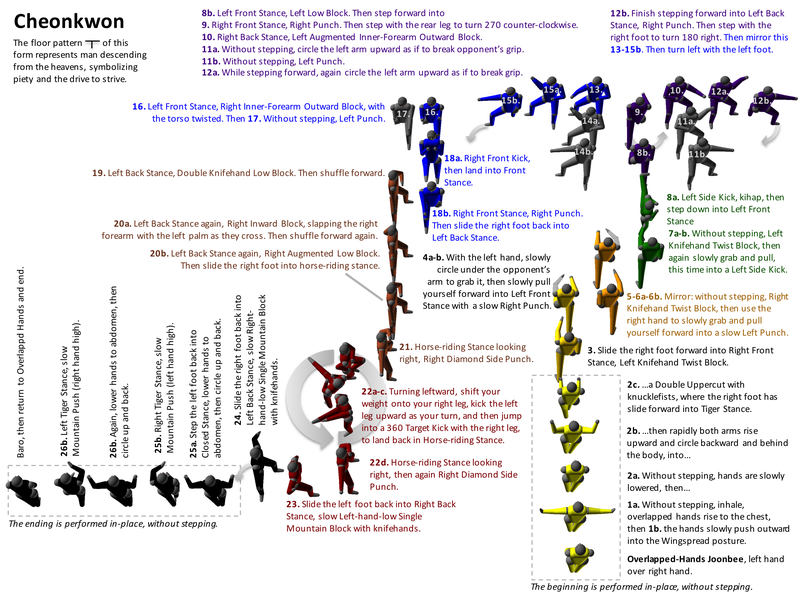 I’m using short abbreviations here because these diagrams aren’t intended to teach you poomsae, they’re just intended to help you remember poomsae. Each illustration is like a little study “cheat-sheet.” Print it out, carry it in your pocket, tack it to your bedroom wall, save it to your iPad…whatever it takes to help you learn and remember the form. 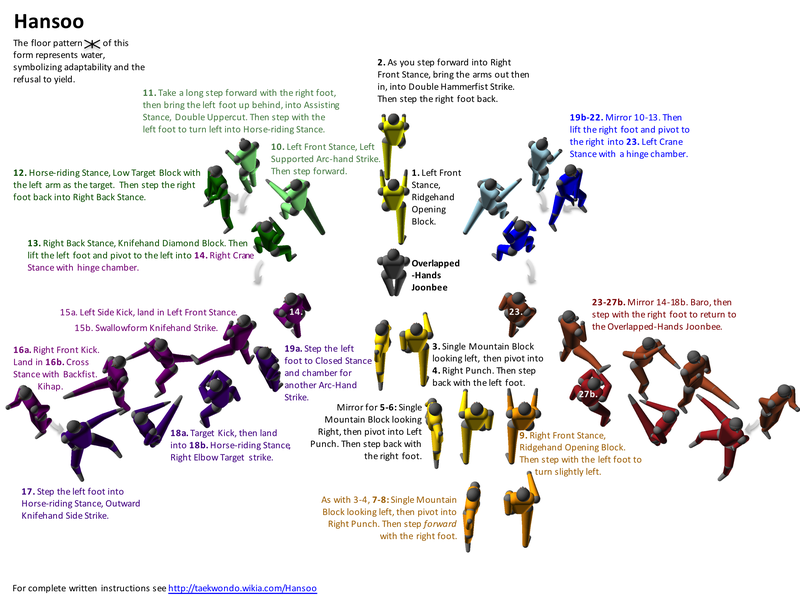 On each robot, I show only the arm or the leg that’s doing the punching, blocking, or kicking. That makes it easier I think to visualize and remember what the robot is doing at each little step. An earlier draft of my study guide used dinosaurs instead of robots, but it was too difficult to understand their positions. The dinosaur tail kept getting in the way. Plus, little boxy robots are easy to draw. If you have suggestions for improvements or other comments, let me know! I originally wrote these study guides for my own use, but I’m happy to share them with my fellow taekwondo students. Enjoy! Many thanks to the masters and instructors at Majest Martial Arts in Sterling, Virginia. Without their instruction, I would not have been able to write this study guide. This entry was posted in taekwondo and tagged majest, majest martial arts, poomsae, poomse, pumse, sterling, tae kwon do, taegeuk, taekwondo on December 22, 2013 by poomsae.